The V-39 Firebird is one of several direct modified versions of the venerable and loved V-30 Winged Defender. The class is named for the Rihannsu “Okhala’dhael” – a mythological creature said to inhabit the Firefalls of Gol Gathong. The creature is said to appear as a bird made of living flame or lava and is nearly impossible to harm. The V-39 was designed to incorporate the latest Romulan shield technology and twin heavy plasma weapons giving the vessel a powerful first strike capability. Internally, the V-39, like it’s counterparts, increased it’s internal space by essentially adding a forward command pod, similar to the Romulan scout Bird of Prey design. This command pod housed the twin plasma torpedoes and moved the bridge forward, as well as including several vital command subsystems. The traditional space of the bridge on the V-30 became a sensor bay and secondary power supply to ensure the vessel could maintain combat optimization. Several other V-30 modification would follow the same basic concept, making the Winged Defender basic design one of the most successful in the Star Empire. The Type-1 was known for having somewhat underpowered main disruptors. Heavier and more powerful than its predecessor, it was intended to take over the patrol and combat duties of the V-30. The Winged Defender was eventually updated rather than replaced, but the V-39 (along with several other modified V-30 designs) did go into general production in 2306. It’s roomier interior and powerful main power plant allowed the V-39 to directly counter several Federation heavy cruiser designs. The V-39, like may other large Romulan vessels, was still a significant drain on the Empire’s resources. It was not until after the Tomed Incident, when the empire finally found the massive resources it’s desperately needed to compete with the Klingons and Gorn, did the Romulan fleet finally bolster it’s production of front line vessels. Production of the V-39 ramped up significantly until nearly 2330. It was at this point that production slowed and plans for a newer version of the popular vessel were drawn up. It would not be until 2348 that the Type-2 was launched, however, and both the Type-1 and Type-2 remained in production together for several more years. They Type-2 saw the replacement of the main power system as well as an increase in the impulse drive. A stronger shield and more powerful photon torpedoes combined to make the Type-2 a truly fearsome opponent. The V-39 Type-2 saw constant combat with the Klingons in the never-ending conflict along the mutual boarder. Occasional encroachment by the Gorn also saw engagements between Gorn ships and the V-39. However, in 2365, as the Empire contemplated re-engaging with the Federation, the decision to update the V-39 again became paramount. The Type-3 saw an overall weight increase as well as a significant power increase. The New RWM-1 power plant gave the V-39 a higher emergency speed and allowed the main disruptors to be upgraded for the first time in nearly 60 years. The primary shields were massively increased, a factor that would prove vital years later during the Dominion War. Despite it’s popularity, the V-39 was still considered an older design. Production of the Type-3 was limited in favor of the truly massive Warbird class, which was quickly becoming the dominant frontline Romulan vessel. A totally of 296 V-39’s have been built over the years. 103 Type-3’s remain in active service. 2 Type-1’s, 1 Type-2 and 3 Type-3’s have been listed as lost. 11 Type-1’s, 18 Type-2’s and 21 Type-3’s have been destroyed, nearly all in some form of combat. 7 Type-1’s, 12 Type-2’s and 17 Type-3’s have been scrapped. 5 have been captured, including 2 Type-1’s by the Klingons, 1 Type-3 by the Breen and two Type-3’s by the Dominion. 50 Type-1’s and 36 Type-2’s are in reserve Fleets. 108 Type-1’s were converted to Type-2’s and 100 Type-2’s were converted to Type-3’s. Production of the V-39 is expected to end within the next 5 years, with most remaining hulls removed from general service within the next 25 years. 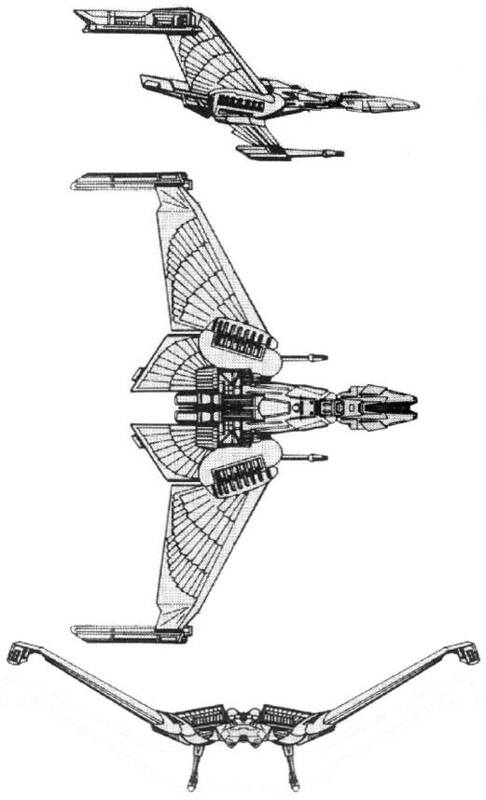 While known as the Firebird class in Romulan, the V-39 is known to Star Fleet as the Phoenix class. Power Units Available – 38 ea. 40 ea. 50 ea.